Keratosis means there is too much keratin, a skin protein, which makes up the tough outer layer of skin. There are many types of Keratosis and it is a fairly common skin condition, affecting around 1 in 3 people worldwide. The three most common types of keratosis are keratosis pilaris, actinic keratosis, and seborrheic keratosis. There are many others, most of which are rare or are inherited. Keratosis Pilaris - In Keratosis Pilaris, you will find small plugs in the outer layer of skin which block hair follicles and cause small, red raised bumps which sometimes look like goose bumps when the skin is cold. It is often called ‘chicken skin’ because of this appearance and it is usually worse in dry and cold month. 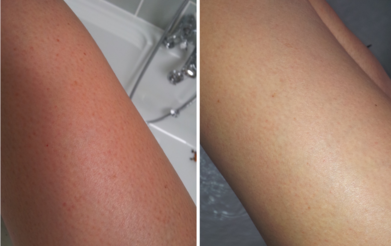 Keratosis Pilaris or 'KP' as it is otherwise known can sometimes be itchy and look unsightly on the skin. It usually appears on the back and upper arms. It can also appear on the buttocks and tops of legs. 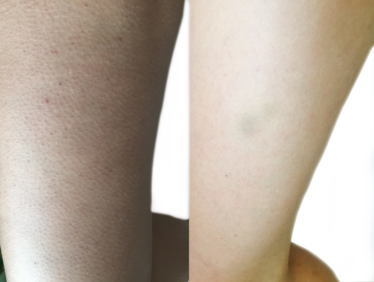 People with Keratosis Pilaris often have a deficiency in vitamin A. The best way to boost this is to eat good sources of vitamin A in foods like dairy products, eggs (yolks), spinach, broccoli, carrots, sweet potatoes and pumpkin. Seborrheic Keratosis - is one of the most common noncancerous skin growths in older adults or those with weak immune systems. Prolonged stress can cause Seborrheic Keratosis because this weakens the immune system. Seborrheic Keratosis usually appears as a brown, black or a light tan growth on the face, chest, shoulders or back. The growth has a waxy, scaly, slightly elevated appearance and can look like warts. Actinic Keratosis - also known as 'Solar Keratoses' is very common. It is caused by too much exposure to UV rays of sunlight. It usually appears on the face, lips, neck, ears, backs of hands, arms and legs. The patches can be skin coloured or more pink, red or brown. They are usually rough or scaly and can be sore and itchy. They are sometimes flat or can stick out from the skin like warts. They can be likened to scabs that do not heal. Actinic Keratosis can sometimes develop into types of skin cancer, so it is always recommended to get them checked out by a qualified doctor. A weak immune system can also cause Actinic Keratosis and older people are more affected. It can also sometimes be caused by a viral infection. Stucco Keratosis - is a keratotic papule that is usually found on the lower extremities. It is a common skin condition that seems to appear with a higher frequency in males. It typically presents itself as a small white/grey pimple or swelling on the skin. It often occurs in high numbers on the skin where a muscle extends or straightens a limb or body part, in particular the lower legs or forearms and the backs of the hands and feet of elderly patients. The lesions appear ‘stuck on’ hence the name stucco keratosis. By now you have probably spent far too much time and money looking for a skin treatment that really works and then been let down and disappointed as the results are far from what you need. Well, we believe your search is over! G16 Skin Repair Lotion has helped thousands of people restore confidence in their skin. We guarantee you will be impressed or your money back! G16 Skin Repair is our newest development and we know that you will love it. G16 is the next generation of its predecessor; the extremely popular G15. G16 soaks in to your skin within three minutes of applying and does not leave any clamminess on the skin whatsoever. Unlike G15, G16 Skin Repair boasts results within only seven days instead of 14 days. Do you want excellent results in just seven days? Give G16 Skin Repair a try, we are sure you won’t be disappointed. But don’t just take our work for it, have a look at the before and after pictures here. It works by our unique formulation of natural acids penetrating the skin and clearing pores. It removes dead skin cells attached to the outer layer skin (epidermis) and encourages new, healthy, hydrated cells to grow leaving your skin smooth, glowing, youthful and with an amazing feel. The other ingredients then come in to play; the Jojoba Oil and Shea Butter gently soften and hydrate the skin and the lotion’s rich Vitamin A, B5 and E content penetrates deep into the skin leaving a barrier to help stop moisture leaving the skin. You will be astounded how G16 Skin Repair clears this condition. Give it a try today!